Providing the ability to right-click (or ctrl-click on a Mac) a list item and initiate an action, the context menu is a nice built-in feature of a List control. However, when the contents and behavior of the context menu differ in different parts of your application, your code can get quickly out of hand. Note: Not only does a List have a context menu but so does any Flex component that extends the InteractiveObject class. In this blog entry, I'm faced with the challenge of sharing a custom List component across an application while providing other developers with the ability to modify the context menu without generating a pile of unmaintainable spaghetti code. To customize a List's context menu, the most common approach taken by inexperienced Flex developers violates OOP's open/closed principle and involves adding code directly to the custom List class. Make sure you read the comments in the code snippets. They may provide some clarification. He can now "activate" his context menu without affecting other instance of SuperList by using the new showContextMenu property. By setting the value of the SuperList's new contextMenuType property, the appropriate context menu is displayed. Do I really need to show you how this turns out? 2 years, 5 developers and 10 change requests later, SuperList contains 1500 lines of code. Most of this code applies to one small aspect of the SuperList component - the context menu. The true purpose of SuperList has been lost. Two techniques can be used to isolate the custom behavior of each custom context menu. The first technique is very common and involves subclassing SuperList. The other technique adheres to the OOP principle of favoring composition over inheritance. Create a custom context menu for SuperList by extending the class and overriding the createContextMenu method. * menu item selection immediately. To me, it seems like a waste to extend SuperList only to add a custom context menu. Instead I'd rather "inject" an object into SuperList and delegate the responsibilities of the context menu to this object. Sounds like the Strategy pattern, right? To accomplish this, I'm going to start with building an interface. Anything that implements this interface will contain a context menu. Again, a slight modification to SuperList is required. 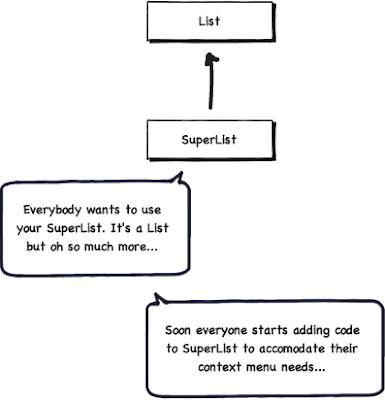 A setter is used to inject the custom context menu into SuperList. This setter accepts any object that implements the ICustomContextMenu interface previously defined. This ensures the injected object contains a context menu. SuperList will use this context menu as its own. Let's review the changes to SuperList. * use this fancy List component while customizing the context menu. Next, I'll create a custom class for each custom context menu. This class must implement the ICustomContextMenu interface previously defined to ensure that it contains a context menu and can be used with SuperList. * we like and we can handle clicks however we please. We can create another custom context menu with it's own unique behavior as long as it implements ICustomContextMenu. Published at DZone with permission of Jeremy Mitchell , DZone MVB. See the original article here.